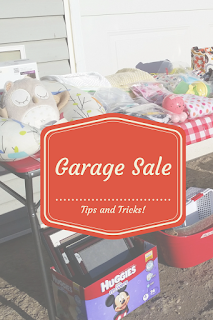 Peaceful Simple Life: Garage Sale-Tips and Tricks for Success! 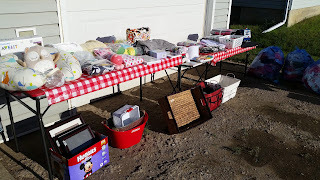 We had our first garage sale on Saturday. We don't normally sell our items. We usually just donate them. We have a few changes coming up and have been working to reduce the number of items that we own. We feel excited to move towards more minimalism. 1.) ADVERTISE We didn't advertise as well as we could have. I would recommend putting up posters on the morning before your garage sale. It will allow time for people to see the poster and be aware of your sale. If you are having a big sale, it might be worth the money to advertise in the newspaper, as well. Our sale wasn't large enough to warrant that kind of advertising. 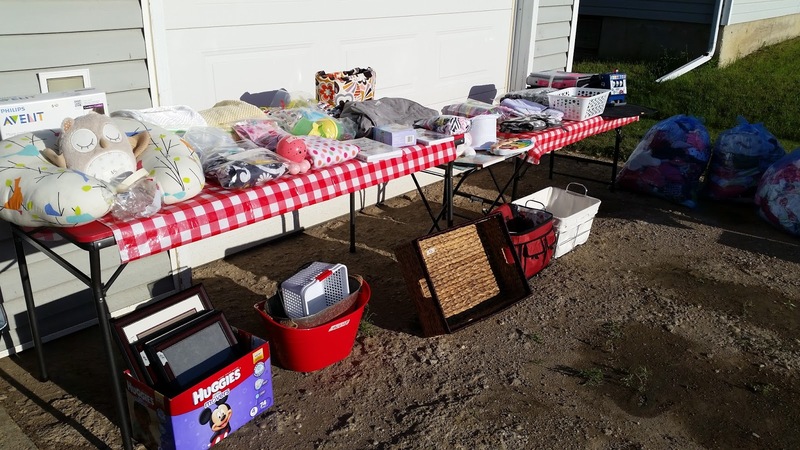 On the morning of our sale, I advertised our sale in our local garage sale groups on Facebook and on my personal Facebook page. On all of our advertisements I put our address, the date and time of the sale and the type of items that we were selling. Facebook was our biggest payoff in advertising. 2.) HAVE A FLOAT I went to the bank the day before our sale and took out money for a "float". You will need to make change for people at the sale and the float allows you to do this. I went a little overboard and had a float of $288 in various denominations. We really didn't need that much but at least we had it. I would recommend a roll of each type of coins and several $5, $10 and $20 bills. You can get a cash box if you want, but I simply put our money in a wallet and a few change purses. I kept it in my cross body bag and on my person. When we had my Grandma's garage sale last year my Dad kept money in his fanny pack. It wasn't particularly fashionable but it was really practical! 3.) PRICE ITEMS FAIRLY We didn't try to make a huge profit off of any of our items. We priced items at or below a 3rd of the purchase price. Most items lose quite a bit of value with time. The items have also been used, which also lowers the value. People will also try to haggle and we took any reasonable price that was offered for our items. 4.) MAKE YOUR HOME STAND OUT We moved our vehicles across the street so they weren't blocking our house our driveway. We put a large, tall sign on the front lawn advertising the sale. People also use balloons to make their homes stand out. Anything that makes your sale more visible from the street will help draw people in. 5.) DISPLAY YOUR ITEMS IN AN ORGANIZED FASHION I tried to group like items together. 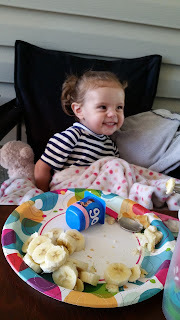 I made categories (baby items, toys, books, household) and set up my tables according to category. We had our large items on the ground, outlining the driveway. We made the tables easy to access and set up anything that needed assembly. People are much more likely to purchase an item if they can see what it looks like all set up. 6.) MAKE SURE YOUR ITEMS ARE CLEAN I have said it before about showing our house and I will say it again about your garage sale items: Most people can't see past dirt. Wipe down the furniture and other items. Wash any blankets or fabric items. Spot clean items that can't be thrown in the wash. Clean makes a big difference. 7.) SETTLE IN FOR THE DAY With the exception of bathroom breaks, our family spent the whole day outside at our garage sale. 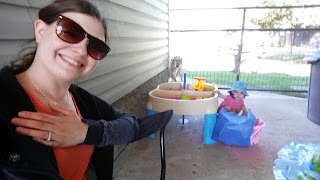 We set up a playroom for Miss. E in the breezeway with toys and snacks. Hubby and I had our phones and the I Pad outside with us. 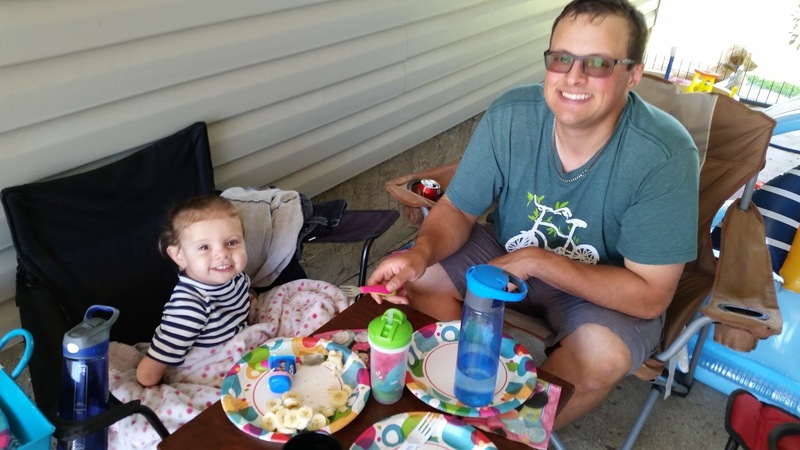 We had a fun day outside and we were always readily available to greet customers. 8.) DECIDE WHETHER YOU WILL ACCEPT "EARLY BIRDS" Early birds can be a good thing and they can be a bad thing. It is really up to you. We had a friend "pre shop" our sale and she bought a few of our larger items. She paid our asking price and ended up giving us a quarter of our profit from the sale. 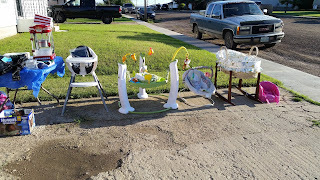 I didn't mind the early birds as I simply wanted to sell our items. If you don't want to accept early birds, then be polite but firm on your start times. 9.) TRY TO HOLD YOUR SALE AT THE BEGINNING OF THE MONTH This tip came from a family friend growing up. People generally get paid at the beginning of the month and therefore will have more to spend on your sale. If possible you should avoid long weekends because people use long weekends to leave the town/city and go camping. 10.) BE SAFE Keep your home locked. Don't allow strangers into your home. If you are dealing with a lot of money, it might be wise to take some of it inside and lock it up. Simple things can make your day safer. What are your tips for a successful garage sale? I would love to hear them! Those are great tips! I haven't held a yard sale in quite some time, but I totally agree about deciding on early birds and making your house stand out. I think it's also really important to price every single item. People don't want to ask how much you want for something and are less likely to buy if things aren't priced. Glad your sale was a success! YES! I totally agree! We priced every single item and it made things much easier for both us and or customers! Love this post! Thanks so much for sharing all of your tips!